Weight loss is the optimum goal and the most critical measure of the effectiveness of gastric sleeve surgery. In surgical procedures, the outcome always depends on many factors. These factors may be patient-specific factors, the type of operation and the competency of the surgeon. In gastric sleeve surgery, the amount and rate of weight loss have been found to be influenced by the competence and technique of the surgeon and the ability of the patient to maintain a healthy dietary and exercise habits. Fischer et al., systematically analyze data from 123 sleeve gastrectomy studies involving 12,129 patients. The huge excessive weight loss in patients who had sleeve gastrectomy was 56.1% at 12 months post-surgery (Fischer et al., 2012). The weight loss varies between 42% -78%. Also in this study, the value of 78% was achieved by the best surgeon and the worst surgeon average was close to 42%. Take, for example, a patient that is 175 lbs overweight (175lbs of excess weight) before surgery will lose about 135 pounds by the end of the first year of operation in the hands of the best surgeon. A similar patient will lose about 75 pounds at the end of the first year of surgery in the hands of the worst surgeon. In another study conducted by Gagner et al., the weight loss data from 130 doctors and 46,133 gastric sleeve surgeries were compared. The average, excessive weight loss at the end of the first year of gastric sleeve surgery was 59% (Gagner, Deitel, Erickson, & Crosby, 2013). Doctors are close to the value gotten by Fischer et al. However gastric sleeve procedure is the most performed type of weight loss surgery today. Because there has been such an influx of surgical volumes, bariatric surgeons have experienced higher outcomes – based on their operational performance. Based on our findings, a competent surgeon with enough experience can realize the following weight loss numbers for patients. Find your ending weight (based on 150 lb ideal weight each). This study did not review the individual surgeon’s data; however, the standard deviation from the mean percentage of excess weight loss among the surgeons was +/- 19% (Gagner, Deitel, Erickson, & Crosby, 2013). This implies that some surgeons have as doctors as 40% excessive weight loss while some have as high as 78%. This deviation showed that weight loss following gastric sleeve surgery is not uniform from one surgeon to the other and the difference is highly significant. 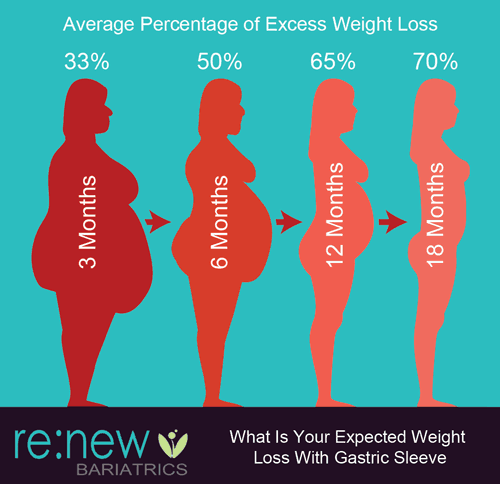 Renew Bariatrics has the necessary experience to minimize complications and provide high expected excess weight loss. Learn more by contacting us today, our surgeons are highly trained at performing gastric sleeve surgery. Thus if we plot these weight loss percentages of different surgeons on the graph, the shape of the graph will follow standard distribution curve (bell curve). The average performing doctors will be within 95% of the curve, while the poor performing surgeons will be 2.5SD below the mean (to the extreme left of the curve) and the best surgeons will be 2.5SD above the average (to the absolute right of the doctor). Weight loss following gastric sleeve surgery is related to the quality of the surgery, presence or absence of complications, and how such complications are managed. All these parameters depend on the competency of the surgeon. If a surgeon resects less than the appropriate portion of the stomach during gastric sleeve surgery, the patient will have a relatively higher appetite, eat more and weight loss will be suboptimal. Thus, knowing that your overall weight loss is partly dependent on the surgeon that will perform your gastric sleeve surgery, it is part of your preparation to get the best of the surgeon to perform your operation in other to achieve maximum weight reduction. Even though our timeline of average weight loss should give you some idea. It’s only an average weight loss. Your actual weight loss can be more or less than that. Ultimately, it was up to you and how hard and dedicated you are postoperative. Are you sticking to your post-op diet? Are you making exercise a regular part of your routine? Many variables contribute to your expected weight loss; many will depend on issues you can control. What if you seem like you’re not losing enough weight after gastric sleeve? There can be numerous issues at play here, but it’s important to stick to your surgeon’s and dietician’s recommendations. Remember, everybody is different and will have mixed results. If you’re genuinely concerned about reduced weight loss, there are several things you can read including Failure after Gastric Sleeve Surgery and Resetting the Pouch. 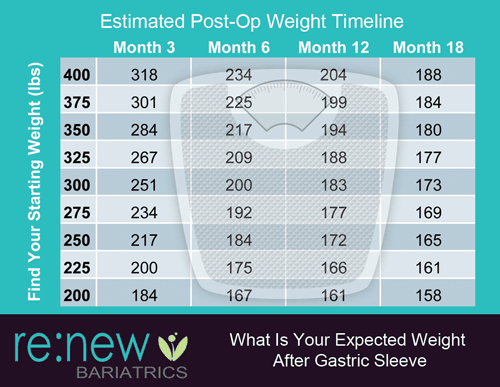 Learn how to undergo affordable Gastric Sleeve Tijuana with one of Renew Bariatrics leading bariatric surgeons. Get Free Consultation with our staff today.